The 2013 Kia Sorento provides a nice middle-of-the-road alternative for those who are looking for more than expected from an economically priced midsize SUV. It still has some minor drawbacks that most drivers will be able to overlook; but all in all, the 2013 Kia Sorento follows the line of its maker - delivering smooth, steady elegance at an affordable price. This year's model is the last before a refresh is due for the 2014 version. That could slow some fingers about to pull the trigger on this purchase. On the other hand, the 2013 Kia Sorento does represent the third model year of this platform and, as they say, the third time is supposed to be the charm. 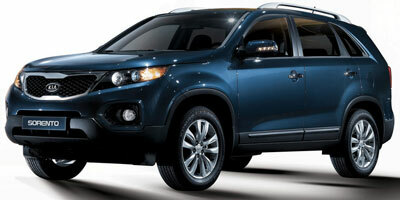 What makes the 2013 Sorento walk the middle of the road is expressed best by current owners. If one were to talk with several 2013 Kia Sorento owners, one would experience a set of reviews that could run the entire gamut of emotion - complete from love to hatred. The 2013 Kia Sorento comes in three trim levels and offers plenty of technology and convenience through a variety of packages. The base model is the LX and it is no slouch when it comes to standard features. It includes heated mirrors, keyless entry, full power accessories, cruise control, air conditioning, 17-inch alloy wheels, Bluetooth, and satellite radio with CD player and iPod/USB/Aux inputs. A convenience package is available for the LX trim that adds foglights, heated front seats, rear parking sensors, auto-dimming rearview mirror, and the Uvo voice-activated electronics interface. Later-year models will also receive an eight-way power driver's seat with lumbar adjustment, leather-wrapped steering wheel and gear shift, and a first-aid kit. The second trim level is the EX. This level upgrades the four-cylinder engine, but most feel that it still remains underpowered. In addition to the upgraded engine, buyers will also get 18-inch wheels, automatic headlights, keyless ignition/entry, dual-zone automatic climate control, the eight-way power driver seat, leather upholstery and the LX Convenience package items (minus the auto-dimming mirror). The EX also offers a V6 model that comes with the choice of a premium package that adds a third-row seat, auto-dimming rearview mirror, rear air conditioning, rearview camera, panoramic sunroof, and a 10-speaker Infinity surround-sound audio system. The highest trim level, the SX, offers only the V6 as an engine choice and bumps the interior up to a premium level. LED taillights, rear air conditioning, and a heated steering wheel are all standards on the Sorento SX. The interior of the 2013 Kia Sorento is one of the most understated of the Kia lineup. Unless you're moving up to the top-level SX you'll get a mildly bland interior that remains comfortable and functional. If it lacks in one particular area it would have to be interior space. The third-row seat is cramped, as are most in this segment, and cargo capacity is 9.1 cubic feet with it in place. Fold it down and capacity increases to 37 cubes, maxing out at 72.5 cubic feet with both rear seats stowed. None of those are impressive numbers. The cockpit features a triple-eye display with all numbers easily visible and well-lit. Buttons and controls are all well laid out and easy to reach for the driver. The steering wheel controls are handy to have but some of them are situated in awkward spots, which makes it easy to bump them when turning the wheel. The navigation system seems to be one of the main areas of concern with current owners. There are complaints that it is both difficult to use and inaccurate. Materials quality is average throughout, nothing to brag about but not many complaints either. Hard plastics are here and there but most seem to be well-covered and placed in areas that won't affect comfort. The second-row seat does not slide for or aft in the standard model (non-third row versions), which makes it less versatile than competitors in this area. There are two engines offered with the 2013 Kia Sorento. The first is the base 2.4L four-cylinder that pushes out 175 horsepower and 169 ft.-lbs. of torque. All models come with a six-speed automatic transmission and standard front-wheel drive. All-wheel drive is an option. The EPA estimates fuel efficiency to be at 21/29 mpg (city/highway) and 20/26 mpg with all-wheel drive, but these numbers are highly disputed by several owners. The optional direct-injected 2.4L four-cylinder bumps power outputs to 191 horses and 181 ft.-lbs. of torque, but that doesn't seem to lift the Sorento out of the realm of the underpowered. The 3.5L V6 is the best choice for this one. It squeaks out 276 ponies and 248 ft.-lbs. of torque, and it seems to handle the weight of the Sorento with more ease. Driving the 2013 Sorento presents a nice isolation from the outside noise of the road and its other weary wanderers. Handling is above average, offering a responsive feel and light maneuvering. The suspension isn't as soft as some that are offered in this class. It gives a pretty firm jolt on those larger potholes and bumps. The one noise complaint received most often comes from a transmission whine that is more predominant on the four-cylinder models. The 2013 Kia Sorento is a Top Safety Pick by the IIHS, earning a mark of Good in all of their crash safety tests. It performed well for the government as well, earning an overall mark of four out of five stars. This is a fairly standard score for the better performers in the midsize SUV class. Standard safety features include antilock disc brakes, stability control, front active head restraints, front-seat side airbags and side curtain airbags that cover only the first and second rows. There are currently no major recalls issued for the 2013 Kia Sorento but it only fairs as average in reliability. Any manufacturer is going to have a few bad apples in the bunch, but the Sorento to seems to have a few more than most. J.D. Power and Associates gave it a score of 3 out of 5 in the Vehicle Dependability Study. MSRP starts at $23,150 for the base model 2013 Kia Sorento, and climbs to $33,400 at the peak. Interested to see how the 2013 Kia Sorento ranks against similar cars in terms of key attributes? Here are the 2013 Kia Sorento rankings for MPG, horsepower, torque, leg room, head room, shoulder room, hip room and so forth.